iPrint.com delivers custom printing just the way you want it, featuring a variety of design options for business cards, stamps, labels, and more stationery essentials. Enter the Promo Code - BIZ30 - at checkout on the iPrint.com website. Business Cards - The custom printing experts at iPrint.com know that your business card is not only your calling card, but a portal to new and exciting opportunities. Make a lasting impression to prospective clients and customers by customizing your own full-color or 1-2 color business cards for as low as 2 cents per card, for maximum impact at minimal cost. Design your own business cards from scratch or choose from iPrint.com's easy to use templates for sleek, stylish and professional business cards, designed in minutes. 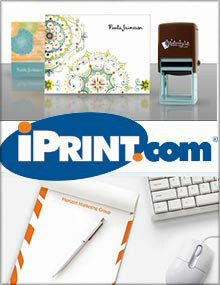 Stationery - Make every mailing your own, at iPrint. Supplement your office stationery supply with premium letterhead, envelopes and notepads that can be personalized and imprinted to create a united and streamlined look. Design your own or choose from iPrint.com's pre-designed options of envelopes, letterhead and notepad styles that will make an elegant expression with every correspondence. Marketing - Order and customize all of your marketing materials in one place with promotional items that include everything from banners, bumper stickers and bookmarks to Loyalty cards, greeting cards, postcards and gift certificates. Add your name or logo, or create your own logo with artwork featured on the iPrint.com site. Create custom marketing materials in 3 easy steps - choose your product, design, enter your information, and you're done. Post-it Notes - Add a personalized touch to every post-it note with standard and full color post-it notepads that can be customized with your name, logo, message, website or photo. Pick your favorite post-it size with post-its as small as 3.5" by 2", and as big as 4" by 6". Labels - Enjoy quick and easy custom printing when you create your own labels online, at iPrint.com. Stock up on full-color address labels available in 14 different colors and designs, plain and classic standard rolled address labels, or premium labels available in plain white, metallic and safety colors. Customize your premium labels by choosing your preferred label size and shape, featuring oval shaped labels, circles, rectangles and squares. Stamps - Leave your mark with high quality stamps for work, your home office or school. Whether you're stamping your address or the date, items that are past due or highly confidential, iPrint.com has all of your stamping needs covered with your choice of pre-inked stamps or self-inking stamps, ink pads and refills, rubber hand stamps and date stamps, closeout stamps, and stock stamps that will keep your work and your life organized. Since 1996, iPrint.com has been your leading online source for high-quality business cards, custom rubber stamps and stationery supplies, providing you with the easiest way to order custom printed products online, at the best quality and the best price.